This blog was started to reflect upon my development as an artist but sometimes events conspire to such an extent that I have to depart from this intention and write about other things that are important and could impact on my life and the lives of everyone in the UK. We are seriously under threat from fracking in Ryedale, a beautiful part of North Yorkshire. I have joined Frack Free Ryedale in order to try and persuade our so called elected representatives to change their minds about it. 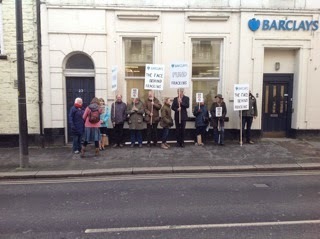 I demonstrated outside Barclays Bank in Malton last Tuesday because they are funding Third Energy, the company that has applied for permission to frack just about a mile from where I live. I am gravely concerned about the lack of information and communication from our councils regarding hydraulic fracturing. I am a parish councillor and was at the parish council liaison meeting held on 22nd October at Ryedale District Council. We were given an overview of the process by a senior officer of North Yorkshire Council’s planning department and while that was fine as far as it went, it was quite obvious that they had no real information about how it would actually affect the residents of North Yorkshire. The officer stated that they were in regular contact with Third Energy, yet was not also consulting with other informed sources of information on hydraulic fracturing. I do not think this is good enough, I would expect people who represent us to be researching widely and consulting with experts other than those with a vested interest in the process of fracking. We are under major threat from hydraulic fracturing in Ryedale and across the UK. This process of extracting gas is not safe; there are many, many examples of how it pollutes water supplies, the land that crops are grown on and causes many types of problems with the health of people living in the vicinity of hydraulic fracturing wells. Conventional oil or gas production does not involve injecting water, sand and chemicals under very high pressure, nor does it produce large amounts of toxic waste water to be disposed of. Water is sometimes used to flush out remaining gas from conventional wells but toxic chemicals and sand are not added to the water as they are in the fracking process. From my own research carried out online from reliable sources, I would strongly refute this claim. Carcinogens such as benzene are added to fracking fluids, which also contain heavy metals and radioactive materials such as radium and radon, which become part of the fluid when drawn from the great depths that wells are bored. Fifty-nine chemicals used in the fracking process have been identified by Concerned Health Professionals of the NY’s recent report (http://concernedhealthny.org/wp-content/uploads/2014/07/CHPNY-Fracking-Compendium.pdf) as being harmful to human health. It might be worth noting as well, that chemicals found in some of our toiletries would also be hazardous if they made their way into our drinking water. I would be very interested to know exactly which chemicals Third Energy plan to inject at pressure into our land, as I suspect the list would include very hazardous ones. With a mini-frac, this might be true because it lasts for only 10-15 hours, but this would surely not be the case with a fully productive well? Again, it is very likely that fresh water would have to be trucked in and the contaminated waste water trucked out. I would very much like to know, if full production were to take place, where the fresh water is to come from. No one seems to be able to fully answer this question. Who are these authorised contractors? Dr Jim Marshall of Water UK said this year that there are no facilities for dealing with this. How will the contaminated waste water be disposed of exactly and where? I do not think it unreasonable to expect a categorical answer to this question. .It is not made clear in the glossy brochure that the amounts of water quoted are the quantities that would be required for a mini frack, not for a fully operational well. Do we really want 4,000 cubic meters, which is 880,000 gallons, of pure water to be used and contaminated for hydraulic fracturing? Water is not an infinite resource as some might think it is. There have been “incidents” at the current site in Kirkbymisperton; I was forced to close all windows and stay indoors by a “mistake” that was made by a worker some years ago. I, among many others, rang the Ryedale District Council about the appalling smell at the time and was referred to someone in charge who admitted somebody had done something wrong. Humans make mistake, it is a fact. On the whole though, I respect that Third Energy have operated safely, but fracking is much more dangerous and risky and it has caused terrible environmental damage elsewhere. Water supplies have been polluted, the air and land around well sites has been polluted and many workers, neighbours and farm animals have become ill. It does not follow that because Third Energy have operated safely with conventional gas extraction, that their fracking operations will be safe. UN toxins expert Dr Marianne Lloyd-Smith said that you can regulate fracking to make it safer but you cannot make it safe. Twenty people locally do not make a major contribution to our economy or employment record and is really quite laughable. Third Energy are being disingenuous here because they are not comparing like for like. Conventional gas wells, of which they speak, are hugely different from a well created by hydraulic fracturing because they do not use the extreme pressure in the process that fracking does. It is the pressure that causes well casings to rupture. According to the Schlumberger report into well integrity, 6% of fracking wells fail immediately, 50% fail after 15 years and all wells fail eventually. It follows then, that just because Third Energy’s conventional wells have not failed, it does not mean that their fracking wells would not fail. It is a ridiculous comparison to make. Again, Third Energy is being economical with the truth here. I accept that the offshore and conventional oil and gas industry is well regulated, (although this has not prevented some major spills disastrous to wildlife in the past). But, there are NO regulations in place relating to fracking, this industry is largely self-regulating. And to make matters worse, the Environment Agency has had its budget cut by 40% meaning that is does not have the manpower or expertise to monitor this industry effectively. 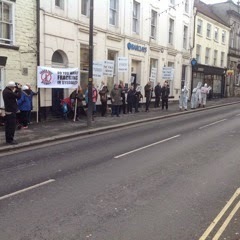 · There is no legally required independent base-line testing of water, air and soil before, during and after fracking. While fracking companies are supposed to do this testing themselves, there is no obligation to make this information available to the public. 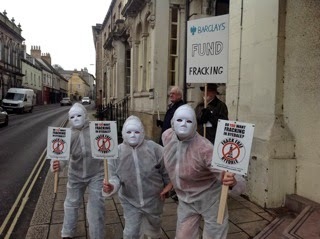 · There is no legally required independent seismic testing before, during or after fracking. · Fracking companies do not legally have to reveal the chemicals that they add to their fracking fluid to the public. Well so far, I have not even received a copy of Third Energy’s glossy six page brochure and I am only about a mile away from their proposed new well. I have heard rumours of a meeting for invited people only but no one seems to know exactly where this is or was due to take place. I do not trust a company that does not have the courage to hold an open meeting; it smacks of underhandedness and cover up. Again, Third Energy is being disingenuous here because the number of truck movements they quote are only about right for a mini frac. If full scale production went ahead, the number of truck movements would increase dramatically and residents would find their normal routines significantly disrupted. But they do not say exactly how much noise, and it will be considerable. The compressors that create the high pressure required for the fracking process are extremely loud and operate during day and possibly night times. Third Energy has NOT told us that the drilling phase is also very noisy and according to their brochure, the second stage, hydraulic fracturing to stimulate gas flow, takes about 35 days. So, for a mini frack, remember, not a full scale production well, the noise residents will have to endure will last for five weeks. Once full scale production starts, the peace and quiet of an area would be a thing of the past. This is outrageous in its assumption that ordinary people are willing to be bribed in such a way. It may sound like a brilliant deal to some communities, until the fact that property prices in the vicinity of a fracking well site fall dramatically. What works out at roughly £200 per resident is not much of a bonus in those circumstances. Come on Third Energy! Please do not patronise us, we are not so stupid as to think that we might all become millionaires if we sign up to fracking. It is likely that the amounts paid will be no-where near the figures you quote. It is also useful for us all to remember that if fracking goes ahead near Kirkbymisperton, it will not be confined to one well only. A fracking well typically is unprofitable within a year or so of it being drilled so new wells have to be constantly drilled nearby. Within 20 years there could be hundreds of wells across Ryedale if Third Energy is allowed to begin fracking.